Khabarovsk stretches along the Amur River for 50 miles. It is the largest economic, financial and transportation center of the Far East with a population of about 600000 people. Khabarovsk City geographically takes central position in the Far East. The city is located on the right bank of the Amur River in Sredneamurskaya lowlands, 30 kilometers from the border with China. According to the Russian version, Khabarovsk was founded in 1858 as a military post named Habarovka (in honor of the Russian explorer in 17th century Yerofei Khabarov). It is not accidental that Khabarovsk officially granted the status of the administrative center of the Far Eastern federal district. Firstly, Khabarovsk is the second largest city in the region. It has the fourth largest area in Russia. Secondly, there is the highest number of federal and regional agencies, and thirdly, this city - the center of the region's culture. Inhabitants of Khabarovsk do not need to go to distant lands “to try the smell of the Taiga”: it is near them. Bolshekhekhtsirsky Reserve, which is used to be "lights" of the capital region, is located in the suburbs. International, scientific congresses, conferences and symposia on various aspects of human existence are regularly held in Khabarovsk. Despite the 150-year anniversary, Khabarovsk is a young city. A quarter of the population are people aged from 15 to 29 years. 50,000 of them study in 28 secondary and higher education establishments. Modern Khabarovsk is rich with talents: actors and musicians of theaters of drama, musical comedy, pantomime, puppetry, symphony and chamber orchestras, folk ensembles are always happy to meet guests. Among the other attractions the most outstanding are the oldest Khabarovsk theater - regional theater of musical comedy (1926), the Central Park of Culture and Rest, the long rail and road bridge (1916) through the Amur River, which was the final link of the Trans-Siberian Railway and the youngest in the city museum of Khabarovsk History. There are lots of attractive places for fishing in Amur and its tributaries. The most popular are a cruise on the Amur, the organization of Russian gatherings, meetings with national and folk groups. Khabarovsk museums take a special place in the city's cultural life. Located at Shevchenko Street Khabarovsk museum was named after Nikolai Ivanovich Grodekov (1894). Museum of Archaeology behalf of A.P. Okladnikov was the first archeological museum in the Far East. Far Eastern Art Museum has one of the largest art collection in the region. Military Historical Museum of Far East has an exposition, which represents the armaments of different years. is Bolshekhekhtsirsky State Nature Reserve was founded in 1963 to protect the Amur landscapes. The main orthodox church of the city is the Temple of St. Innocent of Irkutsk that was found approximately in 1868. The temple was made of wood and was later elevated to the stone. There is the third largest church among the Orthodox temples in Russia after the Cathedral of Christ in Moscow and St Isaac in St. Petersburg. It is the Savior Transfiguration Cathedral (2004). The Church of St. Seraphim of Sarov which was open to the 150th anniversary of Khabarovsk, is a snow-white temple topped by golden domes. The Travel Wheel company offers guests exciting tours: city tours, weekend tours to Bolshekhekhtsirsky Reserve, a visit to rehabilitation center for wild animals, countryside recreation and much more. We hope that our city will become your friend, give you an unforgettable impressions and the pleasant of communication. 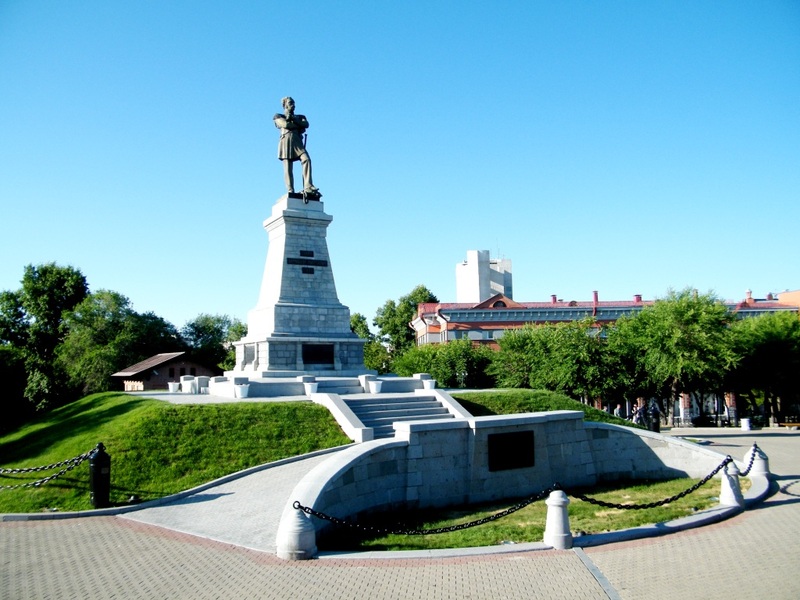 Welcome to Khabarovsk - the city of picturesque boulevards, spacious squares and parks!